Serve Dad this juicy, flavorful, Filet Mignon with Gorgonzola and Caramelized Onions for his Father’s Day Dinner this Sunday, and it’s sure to be a hit! With just 7 Points per serving, this easy steak recipe is the perfect dish for the manly, meat-loving man, but yet also an ideal dish for a Weight Watcher. The flavors are fantastic and rich, and it tastes nothing like a low calorie steak recipe. Though it’s not an official one of Weight Watchers Steak Recipes, this tasty meal is oh so yummy, and tastes every bit as fabulous as a Filet Mignon should. Pair it with some grilled asparagus, my Ranch Roasted Red Potatoes, or my 0 Points Tomato Cumin Salad. So if you are looking for a good Father’s day Recipe idea that will thrill Dad, but still keep you on track with your daily Points allowance, give this dish a try! 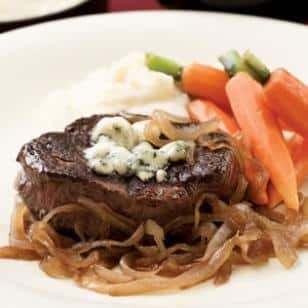 A fabulous idea for a low calorie Father’s Day Dinner, this delicious Filet Mignon Recipe with Caramelized Onions and Gorgonzola cheese is to die for. Juicy and flavorful, it’shard to believe that each serving is just 7 Points. Treat Dad (and yourself!) this Sunday to a gourmet low calorie dinner that will satsify everyone and still keep you from going overboard with your Weight Watchers Points Allowance. Heat 1 tbsp butter in a large skillet over medium heat. Add onions and brown sugar and cook, stirring often, until the onions are very tender and golden brown, about 15 minutes. Add broth, vinegar and 1/2 teaspoon salt and cook, stirring, until the liquid has almost evaporated, 3 to 4 minutes more. Transfer the onions to a bowl; cover to keep warm. Clean and dry the pan. Sprinkle the remaining salt and the pepper on both sides of each steak. Heat the remaining 1 tablespoon butter in the pan over medium-high heat. Add the steaks and cook until browned, 3 to 5 minutes. Turn them over and top with cheese. Reduce heat to medium-low, cover and cook until the cheese is melted and the steaks are cooked to desired doneness, 3 to 5 minutes for medium-rare. Serve the steaks with the caramelized onions. This was really amazing…it gobbled up quite a few of my smart points (weight watchers) because my filet was a bit bigger, but totally worth the splurge. My husband loved it and he is pretty picky. I’d definitely make it again!